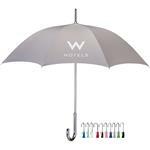 The SOHO Custom Fashion Umbrella in black with a stylish colored trim. 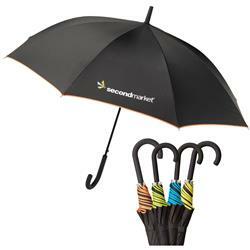 Fashion Umbrella style, 48" arc, Automatic opening, Pongee polyester with neon piping, Black metal shaft / fiberglass ribs, Black rubber coated ferrule, Black rubber coated hook handle. FREE RUSH AVAILABLE! Available Colors: Black Body with Orange, Green, Blue or Yellow Piping. Fashion Umbrella, 48" arc, Automatic opening, Pongee polyester with neon piping, Black metal shaft / fiberglass ribs, Black rubber coated ferrule, Black rubber coated hook handle.